Best Hot Tubs "Hot Tub and Spa Experts"
Our showrooms are in Farmingdale, Westbury and Windham New York, our experience goes back thirty years in the spa business. We work closely with pool, landscaping and construction companies all over Long Island, Manhattan, and New Jersey and Connecticut. Our designers are highly experienced and have worked with all types of homes and yards. Our showroom features fully operating spas, outdoor furniture, pergolas, barbecues, outdoor kitchens, fireplaces, fire pits, accessories and supplies. Our philosophy at Best Hot Tub extends beyond believing that a spa is a good addition to a backyard. The yard is one of the most important parts of the home, and it should be a haven for relaxation. Through all of the services available through Long Island Hot Tub, we encourage every homeowner to complete their yard. This can be accomplished through every channel of our expertise, beginning with the installation of a Bullfrog Spa, incorporating Spa Surrounds, an outdoor kitchen, landscaping, and any other elements to transform your yard into a perfect place to relax, entertain, and enjoy the outdoors. Because we are experienced in working closely with landscaping and construction companies, we can really expedite the process of buying, installing, and using a new spa. The plans can be drawn quickly, and we can orchestrate the entire project from start to finish. Owning a hot tub is a great alternative to a pool. A spa can be hot or cold, still or with jets, and there are very few code restrictions, as with pools. To schedule a consultation, see our showroom, or just talk to a representative, please feel free to call us at 631-465-0175, or use our convenient contact form. Long Island Custom Pools and Spas - Best of Houzz Award Winner! The friendly and knowledgeable sales consultants at Redwood in the Round have been helping people find the perfect hot tub and sauna to fit their lives and their homes for over 36 years now. With well over 2000+ satisfied customers throughout Fairfield and Westchester Counties, and with our newly expanded showroom facility in Fairfield, Redwood in the Round is well-equipped to provide our customers with the very best quality product and service. That is why we are proud to be your authorized Connecticut dealer for Hot Spring Spas and Finnleo Saunas, two award-winning brands that have dominated their industry for more than two decades. Long Island's Premier Outdoor Design Center Specializing in Pools, Spas, Outdoor Furniture, Outdoor Kitchens, BBQ and More. Founded in 1967, Prisco Spas and Pools has been serving the Tri State Area for over 40 years. Prisco Spas has over 5000 customers in the area, and have the largest showroom of Hot Tubs and Swim Spas. Prisco Spas now has over 25 Hot Tubs On Display and 3 Swim Spas. Larges Swim Spa Display in Tri State Area! Suffolk Elite is a Pool Contractor for Inground Gunite Pools & Spas. We serve the Long Island, Hamptons, New York area with well over 20 years experience. Our Gunite Experts are skilled crafstmen with pride on what they do and what they can create. All our projects are done by us, so you wouldn't have to worry or hassle with any additional sub-contractors. Suffolk Elite promises you a 100% Satisfaction Guaranteed! You can contact us by visiting our website, www.suffolkelite.com or join us on Facebook. Add On Pools, a premier builder of in-ground, steel wall, vinyl lined swimming pools, is celebrating our 51st anniversary. We install, repair, replace or refurbish, whatever your swimming pool needs may be. While our main location in Middletown, NJ provides everything needed for in-ground swimming pools and patios, we also have another location in Ship Bottom, LBI, NJ with patio furniture and accessories. We offer a complete line of pool and spa chemicals including, but not limited to, Sustain by PPG, United Chemical, Natural Chemistry and Leisure Time; with options for both chlorine and non-chlorine alternatives for sanitizers. Our inventory includes a full line of Hayward Pool Products, Tranquility Spas and accessories, automatic pool cleaners, replacement liners, safety covers and safety fences by Merlin Industries. Our Mission: Add On Pools' mission is to strive to offer top of the line merchandise, with quality service and workmanship in everything we build and sell. Norm & Mike have been best friends and business partners since the late 1900's (ok, 1999 to be exact...) We are passionate about the benefits of a hot tub, and want you to truly "Relax & Be Healthy". We are one of the largest Jacuzzi Hot Tubs dealers in the US, as well as Clearwater Spas and Dimension One Spas. We are not interested in just selling you a hot tub. We truly want to improve your lifestyle and have you tell all of your friends and family. And that can only happen if we treat you right! Nerok provides the True Automated Lift™ (TAL), a robust and totally unique automated spa cover lift, that with a turn of a switch, opens and closes the cover on spas, hot tubs, and swim spas. TAL’s innovative design is like no other motorized lift on the market. It replaces the outdated manual lift and is favored by dealers and consumers alike for its exceptional reliability, unobtrusive and compact design, and it's simple functionality. TAL is a safe and simple solution for women, seniors, or individuals with limited strength or handicaps and make life easier for every spa owner. Providing the best laser and cosmetic services to the people of New Jersey. Top Permanent Laser Hair Reduction Services in NJ 9 years in a row. Welcome to Pacific Pool and Spa.com. With over 43 years and 3 generations of expertise in the pool and hot tub industry, we'll help guide you in making the right decisions for your next project. We have built and serviced pools and spas from Bergen - Passaic County, New Jersey to Rockland - Orange - Sullivan & Dutchess County, New York. Whether your looking to build a custom pool with fiber optic lighting, incorporate waterfalls with deck & landscape lighting, or looking for the most reliable - therapeutic - energy efficient hot tub, were here to work with you with any budget. Don't settle for ordinary when you can have extraordinary. Let us share our knowledge with a free consultation to bring paradise to your backyard! It’s important that you do some research before visiting a local Glen Cove spa and hot tub dealer. While they can give you lots of information about features and financing, you should have an idea of where you would like to position your spa and what its main function will be. Do you plan to use it mostly for relaxation or socialization? How many people will be using it? All of these things will help the hot tub dealer pick the best models for you. Decide who will be responsible for daily maintenance in your household and if the extra energy costs are something you’re actually willing to incur. Also, know that most hot tub stores in Glen Cove, NY let you do test soaks, also known as a “wet test”, where you can throw on your suit and take each model for a spin in the showroom so you know exactly how they feel before purchasing. Don’t be shy — just think of it as test driving a car! 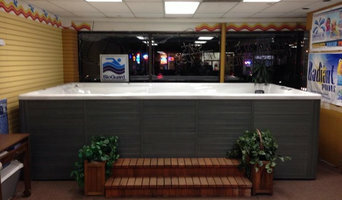 Find spa and hot tub dealers in Glen Cove, NY on Houzz. Narrow your search in the Professionals section of the website to hot tub and spa dealers in Glen Cove, NY. You may also look through photos to find hot tub designs you like, and ask about the details of the spa, including the manufacturer and where it was was purchased.